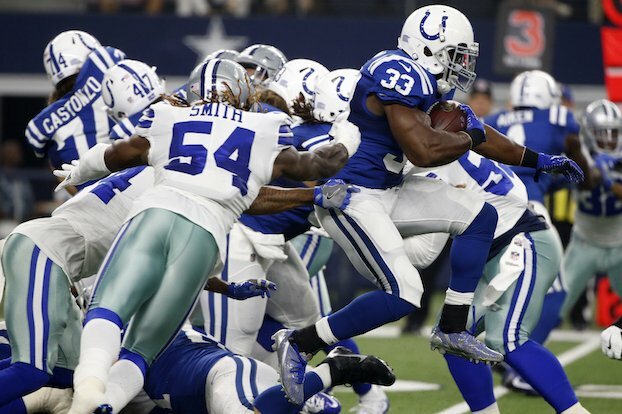 The Dallas Cowboys and Indianapolis Colts are two teams going in completely different directions. Dallas is looking to make it back to the Super Bowl. Even with running back Ezekiel Elliot missing time this season, they should still be in good shape. The Colts, on the other hand, might as well go ahead and tank this season. Jim Irsay kind of sounded like that is what he has in mind if Andrew Luck can’t play. Otherwise, the cost wouldn’t have kept him from bringing in a veteran quarterback—but it did. Yes, it was only a preseason game but with as bad as the Colts looked overall, whatever potential they had for this season is gone. To be fair, the Cowboys are a pretty good team, but there were still plenty of things that were too easy. For those interested in the score, Dallas won, 24-19. Dak Prescott is legit. Some have knocked his ability to throw downfield, but he had no trouble doing so against the Colts on the two drives he played in. Before his night was done, he completed seven of eight passes for 106 yards and a touchdown. Dez Bryant looked as sharp as ever. He made a great 23-yard catch to get the night started and finished the first Cowboys’ drive off with an awesome 32-yard touchdown reception. Darren McFadden looked good overall with 59 yards on nine carries. But what he’ll hear about more when the team watches the film is the fumble that killed the team’s second drive of the game. EZ Nwachukwu looks like he could be the next great possession receiver (three receptions, 36 yards). Jaylon Smith played finally—and he’s lived to talk about it. He didn’t play much (12 plays). But when you consider how jacked up his knee was his return was something special. ”From Day One, I’ve believed in myself, and I thank all the supporters everywhere, even everyone who doubted me,” Smith said after the game (CBSSports). Cooper Rush needs to be the second-string guy. He has looked good whenever he’s played. You can’t say the same about Kellen Moore. “The guy just has that play-making ability. He’s a quiet, smart kid. He’s played a lot of football in his career, being a four-year starter. Just think how far he’s come from OTAs to now. There’s just something about a quarterback who can come in and make plays, much like we experienced when I was young with Tony. If you are stuck during your fantasy draft and don’t know who to pick up, go with a running back that plays the Colts. Dallas has some decent runners, but it looked incredibly easy for them to do the damage they did (160 total rushing yards). The Colts need to let someone else play with the first team. Scott Tolzien is not going to get the job done. The only time the Colts quarterback play showed any promise was late in the fourth quarter when Stephen Morris connected with Freddie Brown on an 18-yard touchdown pass. It was a fantastic throw and an even better catch. Marlon Mack looks like the real deal. The rookie out of South Florida looked pretty good on the five carries he had gaining 45 yards. Offensive line fixed? The defense is the best in the league? Can we believe anything the Colts owner or players say? These guys are terrible. It sounds like the Colts are tired of underperforming former first-round pick Phillip Dorsett. Rumor has it, they are searching for a trade partner. It is not going to get any easier for the Colts. They face off next Saturday against the Pittsburgh Steelers in Steel Town at 7:30 PM ET. The Cowboys will face-off against the Oakland Raiders at home, also on Saturday, with kickoff set for 8 PM ET.